At 14 weeks pregnant with identical twins, I was told I might be developing signs of TTTS. At first we weren’t too worried as the shock of finding out we were expecting twins when we already had three children hadn’t worn off yet! We were incredibly lucky to be diagnosed early, as initially West Mid had sent us to Queen Charlotte’s for a different possible complication, which turned out to be nothing to worry about. However, when we got home and looked up TTTS online we were really worried. TTTS affects identical twins (or higher multiple gestations) who share a placenta. It is not hereditary or genetic. Depending on the number, type and direction of the connecting blood vessels, blood can be transfused disproportionately from one twin (the donor) to the other (the recipient). The transfusion can cause the donor twin to have a decreased blood volume, which means growth slows and the amount of amniotic fluid shrinks. The recipient twin becomes overloaded with blood which puts a strain on its heart, possibly causing heart failure, and too much amniotic fluid is produced. At 16 weeks I was scanned and diagnosed with chronic TTTS. We were told that without treatment our babies would probably not survive, and if they did they would probably have birth defects or be handicapped. At this point things looked very bleak. We were offered a procedure called Fetoscopic laser ablation therapy that day, which we opted to go for as it was our only chance. The statistics are that both babies survive in 60-70% of cases, one baby may survive in 10-15% of cases. If TTTS is severe, both babies may die in about 20-25% of cases despite having laser treatment. The procedure was uncomfortable and took about half an hour to complete, with a large canula and needle inserted through the abdomen and into the amniotic sac of the recipient twin. 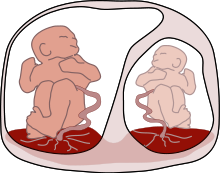 A fetoscope looks at the blood vessels on the surface of the placenta, and ones connecting the twins are lasered. Then excess amniotic fluid in the recipient twin’s sac is removed. My bump was about half the size afterwards! We also saw one of the twins faces on-screen during the procedure as there is a live video feed which the consultant used to locate the interconnecting blood vessels. I stayed in hospital overnight and was scanned again the following morning. Things looked good when the consultant scanned me, although I was bleeding and terrified that I would miscarry. However, as each week passed the outlook improved and I no longer needed to be scanned at Queen Charlotte’s. The only other hurdle was an MRI scan at 24 weeks (quite uncomfortable at that stage of pregnancy!) to check that the twin’s brains were functioning normally. This was thankfully fine, and my pregnancy continued without any complications. At 33 weeks I went into labour, but I don’t think this was caused by the TTTS treatment. Both our girls were born weighing just under and just over 4Ib, and spent 10 days in SCBU. They are now 5 months old and very healthy. Not a day goes by that we don’t think about how lucky we are to have them. We are so grateful to the team at Queen Charlotte’s, as without the laser procedure Anna and Lily would not be here. For more on Twin-Twin Transfusion Syndrome visit the information page on the Action Medical Research website. Action Medical Research, is a British medical research charity, founded in 1952, that have funded over £100 million of research projects into rare diseases affecting children.